The life of Harry Leslie Smith, a working-class rebel to the end, was a towering monument to socialist compassion, internationalism, and peace. I remember how peace smelled on that day in May 1945. Of lilac, petrol and the rotting flesh of the dead German civilians entombed beneath the fire-bombed city of Hamburg. I was 22 years old. After four years of fighting with the RAF, I had survived and been given the chance to grow old and die in a bed. It was a day to weep for those that had been lost but also to dance and celebrate life, to drink to our good fortune. 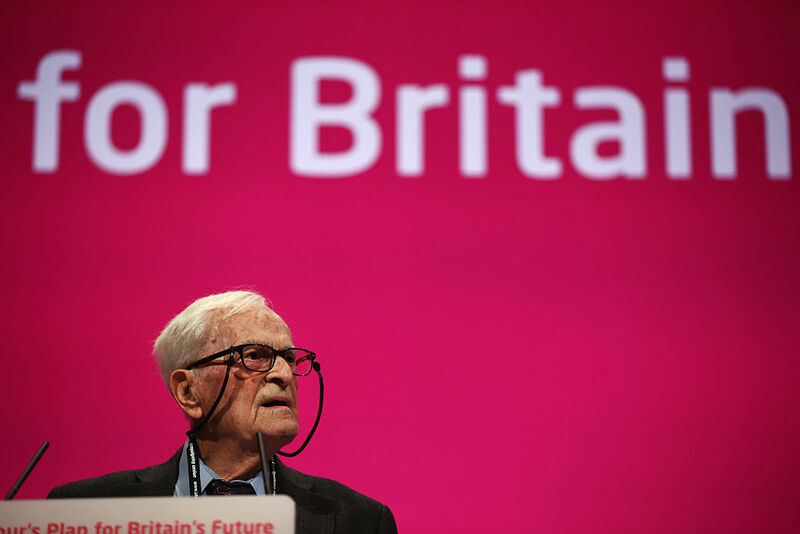 When Harry Leslie Smith entered the public eye, he had already experienced well over eight decades of life and witnessed the cumulative horrors and triumphs of a century that had seen the world engulfed in revolution, reaction, depression, and war. Through his eloquent writing and campaigning, he would share the memories, lessons, and warnings of that century in the hope that younger generations would be spared the needless suffering into which he himself had been born. The son of Lillian Dean and Albert Smith, Harry came into the world by way of Barnsley, Yorkshire during the bleak February of 1923. As he recounted more than ninety years later in the 2014 testament Harry’s Last Stand, his was a country of crippling poverty and social murder. With both the Spanish flu and the trenches of the Great War still hanging in recent memory, his family would eventually live through the Great Depression, Hitler’s bombs, and postwar austerity before seeing the tides turn for working people. This was a Britain before the welfare state or the NHS: one where life for many ordinary people consisted of hunger, low wages, and backbreaking toil in the service of patricians who hoarded the fruits of common labor in their manor houses and shire estates; where class privilege was not only hereditary, but institutionally codified in both culture and politics; and where members of the working poor often died needless deaths amid private affluence and public squalor. Harry would soon lose his elder sister Marion to tuberculosis in 1926, only a day after Britain’s ruling class broke a months-long general strike involving two million workers. His family being too poor to afford comfortable accommodations or a funeral, she spent the final weeks of her life in a workhouse and was laid to rest in an unmarked grave. When he gave his rousing, soon-to-be-viral speech to Labour Party activists in 2014, many Britons were binge-watching Downton Abbey and other airbrushed dramas repackaging the brutal caste system of the 1920s as a world of whimsical class harmony and blandly incremental social change. He would fight to preserve his generation’s memories and resist efforts to revise them with either jingoism or rose-colored nostalgia. His interventions, both in writing and on social media, were pointed and often devastating. Evoking memories of an age before Britain’s welfare state, the country of his present had again become a place where demonizing the poor was a daily ritual of mainstream discourse and tabloid press grotesquery. Criticizing some Labour politicians for their capitulation on the Tory government’s cruel 2015 welfare bill, he backed Jeremy Corbyn (the only MP among the party’s then-leadership contenders to vote against it) and lived to see his improbable leadership defy expectations in the general election of summer 2017. In the last months of the war, as allied forces marched through the Low Countries and western Germany, he had borne witness to the starvation and suffering of ordinary people caught up in organized mass murder. That is why, throughout his final years — spent traveling and living jointly in both Canada and the UK — Harry would eloquently summon his memories in the service of the world’s refugees, advocating for the recognition and dignity of every life regardless of national borders or postal codes. I don’t feel pessimistic or defeated by today’s self-serving political governance, or the crass disregard of ethics by big business. Because I have lived through so much history, I know that we can recover from this malady of self-interest, greed, and short-sightedness. We humans are a resilient and determined race. We have the capacity to do such wondrous things when we apply our intellectual, financial, and spiritual resources to good rather than evil. In reflecting upon his life, we should do much as he did: mourn the dead and fight like hell for the living. He would surely wish for nothing less.